The backbone of the economy of Suriname is the export of aluminium oxide (alumina) and small amounts of aluminium produced from bauxite mined in the country. In 1999, the aluminium smelter at Paranam was closed and mining at Onverdacht ceased; however, alumina exports accounted for 72% of Suriname's estimated export earnings of US$496.6 million in 2001. Suriname's bauxite deposits have been among the world's richest. Inexpensive power costs are Suriname's big advantage in the energy-intensive alumina and aluminium business. In the 1960s, the Aluminum Company of America (Alcoa) built the US$150-million Afobaka Dam for the production of hydroelectric energy. This created the Brokopondo Reservoir a 1,560 km² lake, one of the largest artificial lakes in the world. In 1976–1977, a 100 km long single track railway was constructed by Morrison-Knudsen Co. in West Suriname from the bauxite containing Bakhuis Mountains to the town of Apoera on the Corantijn river, to transport bauxite by river to processing plants elsewhere. The construction of this railway was financially funded by the Dutch government's independence/severance payments after November 25, 1975. After completion of this railway and associated facilities, for political and economical reasons it was never actually used and was left to be overgrown by the jungle. Also plans to construct a dam in the Kabalebo River were developed but never fully executed. In 1984, SURALCO, a subsidiary of Alcoa, formed a joint venture with the (at that time) Royal Dutch Shell-owned Billiton Company, which did not process the bauxite it mined in Suriname. Under this agreement, both companies share risks and profits. The major mining sites at Moengo and Lelydorp are maturing, and it is now estimated that their reserves will be depleted by 2006. Other proven reserves exist in the east, west, and north of the country sufficient to last until 2045. However, distance and topography make their immediate development costly. In October 2002, Alcoa and BHP Billiton signed a letter of intent as the basis for new joint ventures between the two companies, in which Alcoa will take part for 55% in all bauxite mining activities in West Suriname. The government and the companies are looking into cost-effective ways to develop the new mines. The preeminence of bauxite and ALCOA's continued presence in Suriname is a key element in the U.S.-Suriname economic relationship. There is one large scale gold mine operating in Suriname. This is the Rosebel Gold Mine. Development of a second large scale mine called the Merian Gold Project was approved by the government of Suriname on June 7, 2013. This mining project would be a partnership of Newmont Mining Corporation and Alcoa World Alumina and Chemicals. Merian is about 60 kilometres (40 mi) south of the town of Moengo on the Marowijne River. The government estimates there are another 20,000 small scale operators. Only 115 of these were registered by the government in 2009. The government calls these people porknokkers. Because of unemployment in Suriname, some local people turn to small, illegal gold mining as their source of incomes. Gold mining has caused environmental damages in the country. Commission for the Ordering of the Gold Mining Sector (OGS) was established by the government in 2010. OGS is leading the reform effort to develop sustainable and environmentally responsible gold mining practices and transform informal small-scale gold mining into a viable sub-sector of the mining and national economy of Suriname. Suriname does not produce chemical mercury and only allows mercury imports with a license. Since the 1990s these licenses were not issued anymore. Moreover, all licenses are used for mercury imports for medical use or research. Therefore, trade and import in mercury is illegal. Mercury is used in the small-scale gold mining because smuggling made mercury available. However people who are caught with mercury in their possession will be judged and/or fined. On April 13, 2013, the government reached an agreement with multinational IAMGOLD to increase investment in Suriname. On March 1, 2013, Kaloti Mint House Suriname laid its funding stone and is expected to start its refinery production by the first quarter of 2014. Kaloti Mint House will be instrumental in producing “clean gold” in Suriname. Kaloti Mint House have been awarded the ISO 9001:2000 certification for gold and bullion manufacturing and ISO 14001 Environmental Certification. The company is presently applying for ISO 14025 for the Assaying of Gold and Silver. Kaloti will focus on melting and producing gold bars to international standards (999.9 purity) for local and international markets. In October 2013, the UN wants to adopt the Minamata Treaty to ban the user of mercury altogether in Suriname. The Government initiated a training unit within the Ordening Goudsector called the School of Mining. This training unit consists of 14 teachers. The teacher's training started February 2013 and is aimed at preparing them for the fieldwork. The duties of the teachers will be to provide hands-on training on the goldfields to small-scale gold miners. The teachers begin with prospecting and showing the small-scale miners more efficient ways to mine in their areas. Along the way they promote mercury free production methods. The Management of Ordening Goudsector hypothesizes that showing small-scale gold miners the benefits of new production methods will be the incentive itself to start the training programs. The Ministry of Finance initiated a credit fund in March 2013 for small and medium scale entrepreneurs. Small-scale miners can become formally verified entrepreneurs as the piece of land will be viewed as a formal “title” by financial institutes. This means the miners will be eligible for credits and thus can acquire credit to upscale their production. A first amount of 35 million SRD (10.69 million USD, as of Monday, Apr 08, 2013, 04:15 PM GMT) is available for credit through the Central Bank. The Mining Law says that one can only mine with a license from the Government. Ordening Goudsector regulates the concessionaires, how many machine owners there are and what the movements of small-scale miners are. New mining areas are still being issued. However it is important to note that data show that the interesting area to mine, especially for the small-scale miners who look for alluvial gold, is the Greenstone belt. The greenstone runs from Guyana, through Suriname, into French Guyana. This greenstone belt, however, only counts for 15% of the Surinamese surface. At the moment almost all areas in this belt are already given out in concessions. After the return to a more or less democratically elected government in 1991, Dutch aid resumed. The Dutch relationship continues to be an important factor in the economy, with the Dutch insisting that Suriname undertake economic reforms and produce specific plans acceptable to the Dutch for projects on which aid funds could be spent. In 2000, however, the Dutch revised the structure of their aid package and signaled to the Surinamese authorities their decision to disburse aid by sectoral priorities as opposed to individual projects. Although the present government is not in favor of this approach, it has identified sectors and is now working on sectoral analyses to present to the Dutch. After a short respite in 1991–1996, when measures taken in 1993 led to economic stabilization, a relatively stable exchange rate, low inflation, sustainable fiscal policies, and growth, Suriname's economic situation deteriorated from 1996 to the present. This was due in large part to loose fiscal policies of the Wijdenbosch government, which, in the face of lower Dutch development aid, financed its deficit through credit extended by the central bank. As a consequence, the parallel market for foreign exchange soared so that by the end of 1998, the premium of the parallel market rate over the official rate was 85%. Since over 90% of import transactions took place at the parallel rate, inflation took off, with 12-month inflation growing from 0.5% at the end of 1996, to 23% at the end of 1998, and 113% at the end of 1999. The government also instituted a regime of stringent economic controls over prices, the exchange rate, imports, and exports, in an effort to contain the adverse efforts of its economic policies. The cumulative impact of soaring inflation, an unstable exchange rate, and falling real incomes led to a political crisis. Dutch aid stopped to a large extent after Dési Bouterse was elected president. Aid from China has increased. Suriname elected a new government in May 2000, but until it was replaced, the Wijdenbosch government continued its loose fiscal and monetary policies. By the time it left office, the exchange rate in the parallel market had depreciated further, over 10% of GDP had been borrowed to finance the fiscal deficit, and there was a significant monetary overhang in the country. The new government dealt with these problems by devaluing the official exchange rate by 88%, eliminating all other exchange rates except the parallel market rate set by the banks and cambios, raising tariffs on water and electricity, and eliminating the subsidy on gasoline. The new administration also rationalized the extensive list of price controls to 12 basic food items. More important, the government ceased all financing from the central bank. It is attempting to broaden its economic base, establish better contacts with other nations and international financial institutions, and reduce its dependence on Dutch assistance. However, to date the government has yet to implement an investment law or to begin privatization of any of the 110 parastatal, nor has it given much indication that it has developed a comprehensive plan to develop the economy. Oil is a promising sector. Staatsolie, the state-owned oil company, produced 16,200 barrels (2,580 m3) a day in 2012. Staatsolie currently refines 7,350 barrels (1,169 m3) a day at Tout Lui Faut in the District of Wanica and is building more capacity to go to 15,000 barrels (2,400 m3) a day. Some big companies are getting the hardwood out of the jungle. However, proposals for exploitation of the country's tropical forests and undeveloped regions of the interior traditionally inhabited by indigenous and Maroon communities have raised the concerns of environmentalists and human rights activists both in Suriname and abroad. These opposing parties are not yet strong in Suriname. State-owned banana producer Surland closed its doors on April 5, 2002, after its inability to meet payroll expenses for the second month in a row; it is still unclear if Surland will survive this crisis. It was remodeled as Stichting Behoud Bananen Sector Suriname (SBBS). The rumour was that because of political differences Surland was manipulated in shutting down. The SBBS has made banana profitable for the first time in 20 years. A member of CARICOM, Suriname also exports in small numbers rice, shrimp, timber, bananas, fruits, and vegetables. Moreover, in January 2002, the government renegotiated civil servant wages (a significant part of the work force and a significant portion of government expenditure), agreeing to raises as high as 100%. Pending implementation of these wage increases and concerned that the government may be unable to meet these increased expenses, the local currency weakened from Sf 2200 in January 2002 to nearly Sf 2500 in April 2002. On March 26, 2003, the Central Bank of Suriname (CBvS) adjusted the exchange rate of the U.S. dollar. This action resulted in further devaluation of the Surinamese guilder. The official exchange rate of the US$ was SF 2,650 for selling and SF 2,600 for purchasing. With the official exchange rate, the CBvS came closer to the exchange rate on the parallel market which sold the U.S. dollar for SF 3,250. Before 2004: Surinamese gulden (SRG) = 100 cent, SRD 1 = SRG 1000; coins had extremely low official value and a much higher collector's value; their official value has now been multiplied by 1000: the value in SRD cent is equal to the former value in SRG cent. The same applies for "currency notes" (SRG 1 and 2.50). (PPP) 2.71 Bln. 2.78 Bln. 3.63 Bln. 5.31 Bln. 5.79 Bln. 6.24 Bln. 6.63 Bln. 6.88 Bln. 7.33 Bln. 7.91 Bln. 8.28 Bln. 8.66 Bln. 8.84 Bln. 8.70 Bln. 8.36 Bln. 8.51 Bln. There are no Patent Laws in Suriname. ^ "World Bank forecasts for Suriname, June 2018 (p. 152)" (PDF). World Bank. Retrieved 6 September 2018. ^ "Ease of Doing Business in Suriname". Doingbusiness.org. Retrieved 2017-01-25. ^ "Export Partners of Suriname". CIA World Factbook. 2015. Retrieved 26 July 2016. ^ "Import Partners of Suriname". CIA World Factbook. 2015. Retrieved 26 July 2016. ^ "Alcoa in Surinam". Alcoa. Retrieved 2013-04-21. ^ "Merian Gold Project, Suriname". Archived from the original on 2013-03-19. Retrieved 2013-05-10. ^ "Suriname lawmakers approve Newmont gold mining deal". Reuters. June 8, 2013. Retrieved 2013-06-13. ^ Cairo, Ivan (January 11, 2011). "Suriname government starts structuring gold mining industry". Caribbean News Now. Retrieved 2013-05-10. ^ "Suriname government starts structuring gold mining industry - Caribbean News Now". Caribbeannewsnow.com. Retrieved 11 June 2015. ^ "Suriname moves to end chaos in its gold sector". Caribbean Life. Retrieved 11 June 2015. ^ a b "The Suriname Small Scale Gold Mining Sector" (PDF). Gov.sr. Retrieved 8 November 2017. ^ "Government Act" (PDF). Gov.sr. Retrieved 7 November 2017. ^ "Starnieuws - US$ 4000 boete voor bezit kwik". Starnieuws.com. Retrieved 11 June 2015. ^ "NoSpang - Suriname Network Online". Nospang.org. Retrieved 11 June 2015. ^ "Starnieuws - Nimos zet eerste stap naar uitbanning kwikgebruik". Starnieuws.com. Retrieved 11 June 2015. ^ "IAMGOLD - IAMGOLD definitive agreement with Government of Suriname approved by National Assembly". Iamgold.com. Archived from the original on 13 June 2015. Retrieved 11 June 2015. ^ "IAMGOLD Corporation - IAMGOLD definitive agreement with Government of Suriname approved by National Assembly". Newswire.ca. Retrieved 11 June 2015. ^ "Dubai's Kaloti to set up gold refinery in Surinam". Tradearabia.com. Retrieved 11 June 2015. ^ "Precious Metal Services & Solutions in Dubai: Kalotico.com". Kalotico.com. ^ "Minamata Convention Agreed by Nations". Unep.org. Archived from the original on 9 February 2014. Retrieved 11 June 2015. ^ "Draft text for a global legally binding instrument on mercury" (PDF). Gov.sr. Retrieved 7 November 2017. ^ Super User. "Error 404 - Centrale Bank van Suriname". Retrieved 11 June 2015. ^ Simon Romero (April 10, 2011). "With Aid and Migrants, China Expands Its Presence in a South American Nation". The New York Times. Retrieved 25 November 2012. ^ "Annual Report 2012" (PDF). Staatsolie. Archived from the original (PDF) on December 6, 2013. Retrieved September 10, 2013. ^ "Company Profile" (PDF). Staatsolie. Archived from the original (PDF) on February 3, 2013. Retrieved September 10, 2013. ^ "Hét branchemedium voor de AGF-sector". Agf.nl. Retrieved 7 November 2017. ^ "Report for Selected Countries and Subjects". Retrieved 2018-09-20. ^ "Gazetteer - Patents". Billanderson.com.au. Retrieved 7 November 2017. 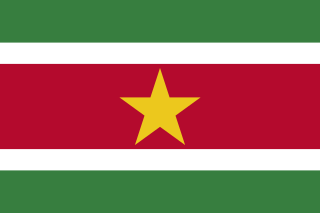 Suriname, officially known as the Republic of Suriname, is a country on the northeastern Atlantic coast of South America. It is bordered by the Atlantic Ocean to the north, French Guiana to the east, Guyana to the west and Brazil to the south. At just under 165,000 square kilometers, it is the smallest sovereign state in South America. Suriname has a population of approximately 558,368, most of whom live on the country's north coast, in and around the capital and largest city, Paramaribo. The Surinamese dollar has been the currency of Suriname since 2004. It is normally abbreviated with the dollar sign $, or alternatively Sr$ to distinguish it from other dollar-denominated currencies. It is divided into 100 cents. Moengo is a town in Suriname, located in the Marowijne district, between Paramaribo and the border town Albina. Moengo is also a resort (municipality) in the district of Marowijne. Alcoa's first bauxite mine in Suriname was located in Moengo. In former times it was a major centre for the mining and storage of bauxite. The Moengo Airstrip is one of the oldest airports in Suriname, in use since August 1953, when the Piper Cub (PZ-NAC) of Kappel-van Eyck named "Colibri" landed there from Zorg en Hoop Airport. Paranam is a town in the Para District, Suriname. Benzdorp is a town in the Sipaliwini District of Suriname. Benzdorp is a small village in the southeast of Suriname in the district Sipaliwini and named after the English consul and bullion dealer Benz. Suriname–United States relations are the bilateral relations between the Republic of Suriname and the United States of America. The Sadiola Gold Mine is an open-pit gold mine situated near Sadiola, in the Kayes Region of Mali. The operation is jointly owned by AngloGold Ashanti and Iamgold, who each have an effective holding of 41%, while the Government of Mali owns the remaining 18%. The International Finance Corporation originally held 6% of the mine put sold this share equally to Anglo and Iamgold in December 2009. The Yatela Mine is an open-pit gold mine situated near Yatela, 25 km north of Sadiola, in the Kayes Region of Mali. It is a single-pit operation. Commencing operation in 2001, heap leaching together with carbon-loading is carried out at a rate of approximately 2.9 million tonnes per year. The final step of eluting carbon and smelting the gold in the gold recovery process is completed at the Sadiola Gold Mine. The West Suriname Plan is an economic development plan for the western part of Suriname. As originally conceived, it consists among others of the mining of bauxite in the Bakhuis Mountains, the building of a hydroelectric power plant on the Kabalebo River, and the construction of a harbour and an aluminium smelter at Apoera. The plan was the brainchild of former Surinamese Minister of Development Frank Essed. The Rosebel gold mine is jointly owned by Iamgold (70%) and the government of Suriname (30%)..
Tanzania is a land rich in minerals. Mining makes up more than 50% of the country’s total exports, of which a large part comes from gold. The country has gold reserves of 45 million ounces, generating revenue of over a billion USD. Diamonds are also found in significant amounts. Since it was opened in 1940, the Williamson diamond mine has produced 19 million carats of diamonds. Gemstones, nickel, copper, uranium, kaolin, titanium, cobalt and platinum are also mined in Tanzania. Illegal mining and corruption are ongoing problems. In 2017, the government passed a series of bills aimed at increasing revenue from minerals after a scandal which caused the dismissal of the Minister for Energy and Minerals. Michael Ashwin Satyandre Adhin is a Surinamese educator, politician, and the Vice President of Suriname since 2015. He is a member of the National Democratic Party. At the age of 36, he became the youngest Vice President in the history of Suriname to lead the Council of Ministers. Adhin is a Hindu of Indian descent.